VISTA, Calif. /California Newswire/ — Stars and Stripes Events, a concert production company located in Escondido, Calif., is promoting a surf rock concert with former members of eight of the best known famous surf rock bands of the sixties. The promoter will donate 10 percent of ticket sales directly to Wounded Warrior Homes also located in Vista Calif. The "Legends of Surf Music" concert is at the Moonlight Amphitheatre in Vista on October 25. These surf bands are attributed with such songs as "Surfin USA," "Wipeout," "Little Deuce Coupe," "Little Honda," "Surfer Joe," "Pipeline," "Out of Limits," "Misirlou," "Let's Go Trippin," "Little Old Lady From Pasadena," "Dead Mans' Curve," "Mr. Moto," and dozens more. 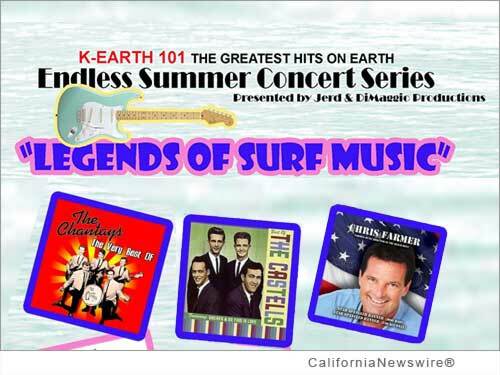 The "Legends of Surf Music" concert will be held at the Moonlight Amphitheatre at 1200 Vale Terrace Drive Vista, CA 92084, on October 25, 2014.